The best septic maintenance product on the market for over 40 years! Your home requires maintenance. Some of your home's systems require more than others. Just like the air filters that need to be replaced once a month, your septic system needs monthly maintenance. Septi-Zone adds new enzymes and bacteria that work quickly! It provides powerful, fast-acting natural clean-out enzymes to work along with the good bacteria. Amalyse: breaks down all starches. Septi-Zone doesn’t stop there. After it turns all those system-clogging solids into water, it will flow freely out into the drain field. Regular use of Septi-Zone could prevent damage to your drain field. Septi-Zone's efficient pH controls help keep a neutral chemical balance which helps prevent pipe corrosion surrounding soil from becoming too acidic or alkaline. Doesn't your yard deserve it? Don't you deserve a yard that's beautiful and healthy? Septic tank and pipes clear, smells gone, drain fields working freely. All papers, fibers, cotton, sludge, greases, and fats dissolved. It all starts overnight with the first use of Septi-Zone. Don't believe the pumping options of some tank pumpers - as long as the active working space between the scum and the sludge is adequate to decompose the sewage by bacterial action, the tank does not have to be pumped. It's an erroneous idea that a tank needs to be pumped out when it is full. The tank is always full. So just pour a bag of Septi-Zone down your commode once a month and forget about pumping. Sept-Zone contains special bacteria and enzymes which convert and digest organic waste and helps you maintain a trouble-free septic system. You'll call it your septic tank insurance policy - especially since it is guaranteed to deliver trouble-free use of your septic tank - or we'll refund every penny you paid for your Septi-Zone! Replacing a drain field can cost more than $10,000. The beauty of Septi-Zone is that even though you can pump out the septic tank, you CANNOT pump out the drain field! 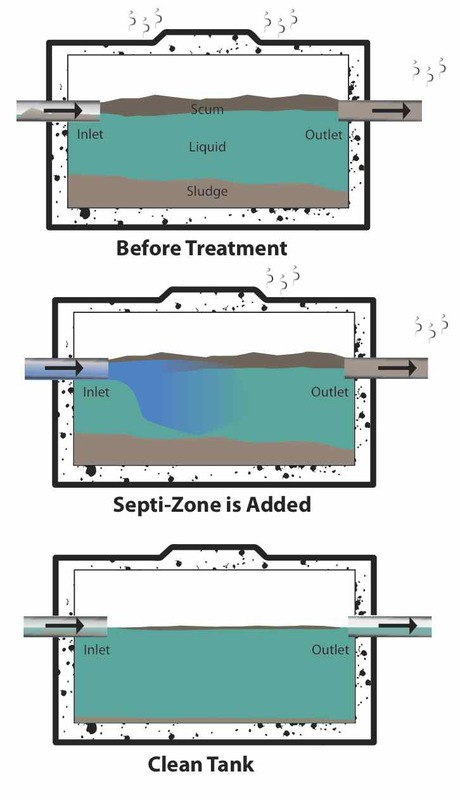 Septi-Zone breaks down fats and greases before they can enter the drain field and cause clogging. Preventative maintenance is the key to never having to pump again! Septi-Zone is available in 6 batch sizes. If you've never used our product before, we recommend either the 12 lb or the 18 lb case. Contact us using the contact form below if you need a recommendation or if you or your organization needs more than our 50 lb size. Septi-Zone is a blend of high potency enzymes that act as a catalytic agent and speed up the fermentation rate when coming in contact with organic waste. The enzymes digest dead organic waste matter by living, friendly bacteria. They recycle wastes back to the simple basic parts of soil, air, and water they were formed from. Used by the natural laws that govern them, they feed on wastes, digest, liquefy and recycle them back, to actually enrich our environment. They produce no poisons or damaging side effects in the process. Their action is complete. Today, our systems do not receive an adequate bacteria supply from natural sources. Use of acids, caustics, detergents (and modern bacteriostats and disinfectants to kill germs), also kill the friendly bacteria our systems must have to operate trouble-free, healthfully, and without great maintenance costs. How long will it take for Septi-Zone to work? It depends on the condition of the septic tank. Generally, Septi-Zone takes one day to three weeks to end smells, clogs and backups. Every month of continuous use is recommended. Typically if a tank is filled with 4 feet of sludge, one month of Septi-Zone treatment will reduce that to 1 foot; 12 inches of fats and grease scum will be reduced to less than two inches. Is Septi-Zone safe around my family and pets? All the enzymes in Septi-Zone are Salmonella negative, non-pathogenic, non-toxic, harmless to animals or man. Yes. With regular use, Septi-Zone will keep your septic system working properly and eliminate clogging and odor-causing drain field problems. Will Septi-Zone damage my pipes or septic tank? No, Septi-Zone is completely safe for your pipes and tank. 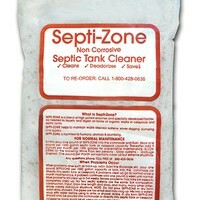 Using Septi-Zone on a regular basis will keep sludge, grime and bio-matter from building up. How do I use Septi-Zone? Simply add to any commode and flush. Use 1/2 bag per month for two people in the house. If more than two in the house, use one bag per month. How long has the proprietary Septi-Zone formula been on the market? Our original idea actually started the septic maintenance sector – we were the very first company to introduce the concept that a properly maintained system is crucial. And we’ve had many competitors come and go over the years. They have all tried to replicate what we offer, but they just cannot. Septi-Zone is simply the best product on the market. Period. To contact us directly, please call (908) 278-6919.